During my practicum, I was introduced to a series of three books. 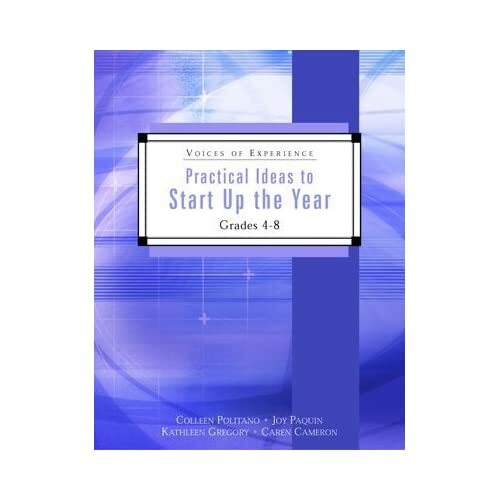 They are "Practical Ideas to Start up the Year", "Spark Up" and "Wrap Up". There is a few grade level versions. They are quite expensive for small books, but very worth it. I am lucky that my principal has a few copies in his office, so I just borrow them as needed. Great series of books! 3 in the set. One thing discussed in the "Start Up" book is a class agreement. I know a lot of classrooms have rules (as they should), but I really liked the idea of building those with the class as a set of expectations. I do this over the first week of school. First, I read "David Goes to School" by David Shannon. The kids think David is hilarious (as do I). Although this picture book could be used with a kindergarten class, it is still quite enjoyable at the higher grades. We talk about some of the things that David does that aren't the greatest of ideas. I leave it at that for the first day. The next day, I set up a "Looks Like, Sounds Like, Feels Like" chart on the Smartboard. I ask "What do you want our classroom to look like, sound like, and feel like?" The class first has table discussions and then we will in the whole class chart. On day three, we re-evaluate the chart and add in anything else we may have forgotten the day before. We then work to turn everything into full sentences. I limit it to three sentences that include all of our ideas. That means we start talking about the terms "responsible", "respectful", "safe". These just happen to be part of our school motto. 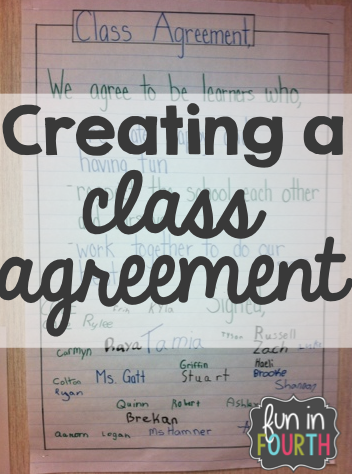 Day four I have the class agreement written on chart paper. 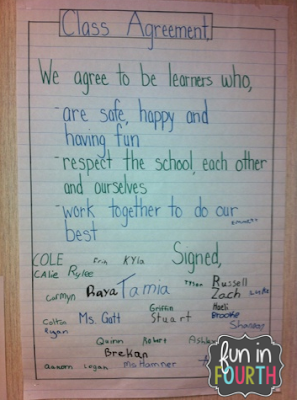 It starts with "We agree to be learners who..." I give everyone one last chance to do some editing. I feel that if they all have to agree to it for the entire year, I want the students to have a say in every step of the process. When we all agree, everyone comes up to the front and signs it. The finished chart paper now hangs up in the front of my class. I refer to it as needed. Because they signed their names it is very effective to remind them that they agreed to what it says. Want to know more? Read this post all about building your classroom community.